Various photos from throughout Margaret Bergmeister Pointkouski’s life. Top Row: First Communion Day (circa 1919-1920), with her first born – my dad (circa winter 1934-35), with husband James (1957), portrait (1972). Center: Bergmeister siblings in 1959. Bottom Row: portrait (circa early 1930’s), with husband James (1962), and with children (winter 1942-3). 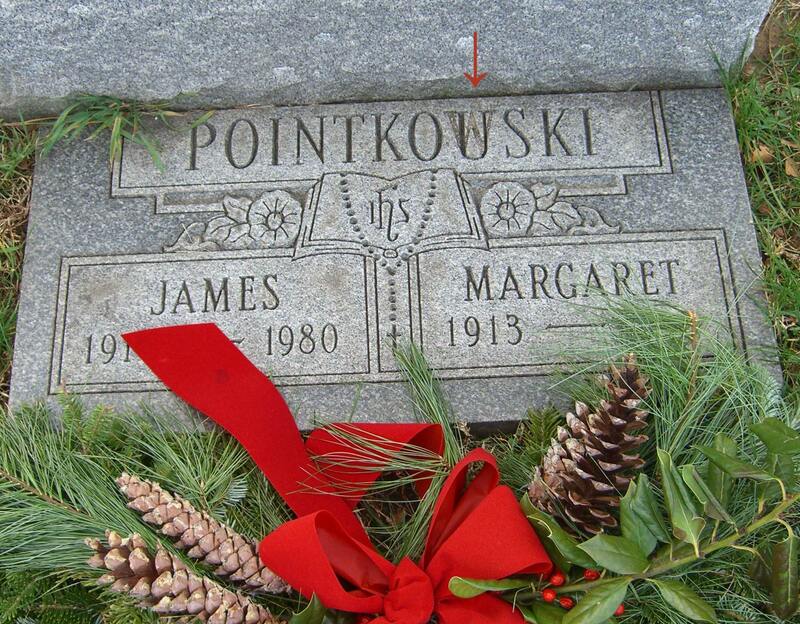 Married: James Pointkouski on 13 January 1934 in Media, Delaware County, Pennsylvania. 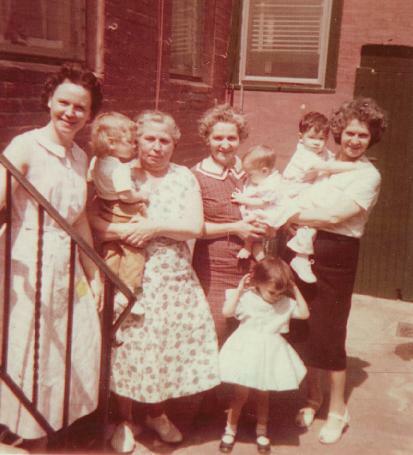 The civil marriage was later blessed at St. Peter’s RC Church, Philadelphia, PA.
Grandchildren & Second Cousins: From left to right: Mabel, Carol, Marie, Helen holding Robert with Suzanne below, and Margaret holding Drew. Marie and Margaret are sisters & Helen is their sister-in-law. Marie is holding her granddaughter Carol, Mabel’s daughter. Helen is holding her grandchildren, and Margaret is holding her grandson (my brother). Photo date – around spring of 1960. Grandmom’s middle name, according to her baptismal record, was Hermina. No one knew where the name came from until I found Uncle Herman Goetz in my research, her father’s half-brother who was also her godfather. The reason why no one in the family remembered Uncle Herman is because he died in 1918 and she likely didn’t remember him at all. She was probably named after her maternal grandmother, Margarethe Fischer Echerer (1845-1895). 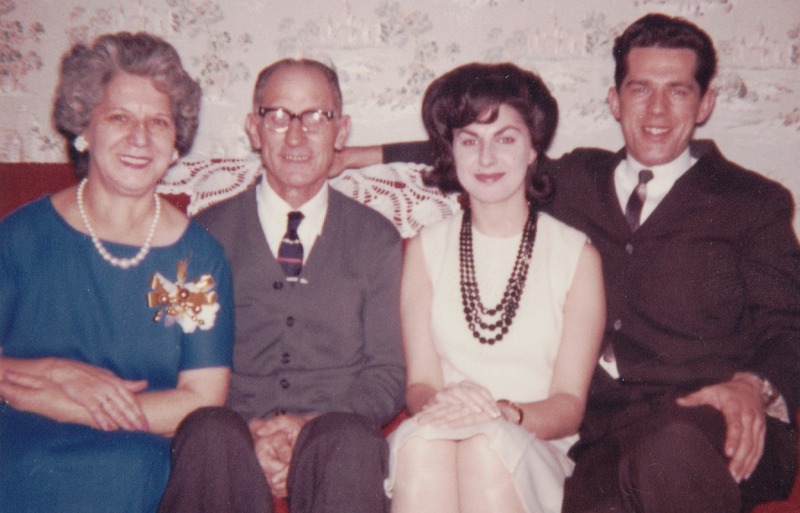 Grandmom barely knew her parents. Her mother died in 1919 about six weeks before Grandmom’s 6th birthday. Then in 1927 when she was not quite 14, her father died. Although she was born in 1913, she is completely missing from the 1920 and 1930 census! Her first child, my father, was born less than seven months after the wedding. According to my Aunt Jean, when Grandmom was born she was so tiny that she could fit into a shoebox. Her parents weren’t sure she’d survive – they had two children in between her brother Julius and her that only lived for one day. 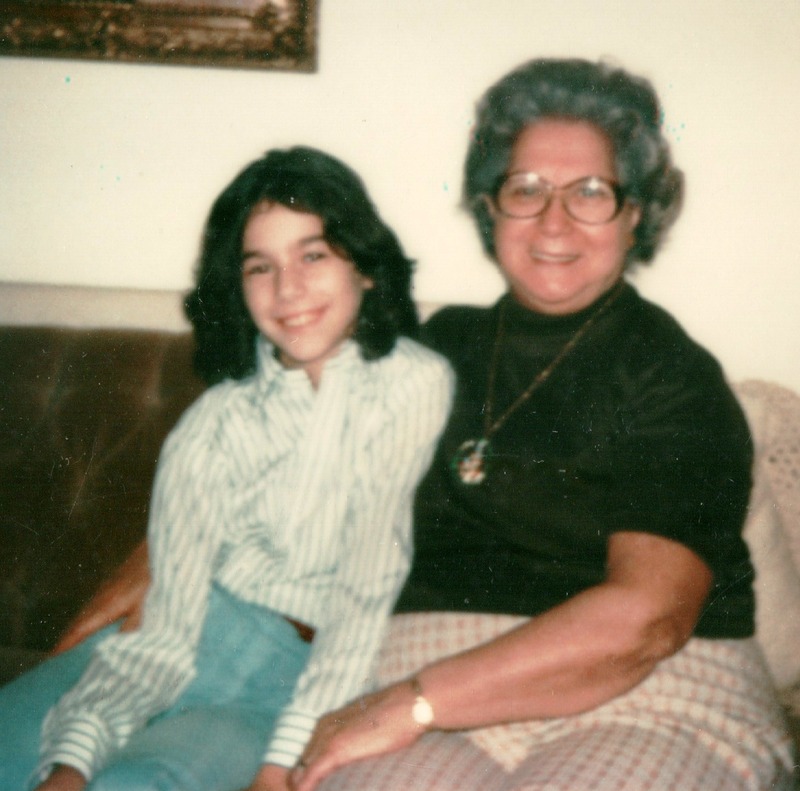 My grandmother always said that her Aunt Laura was very good to her. Laura was Hilaury Bergmeister Thuman, her father’s sister. After her parents died, Aunt Laura and her husband, Uncle Max, were the closest thing to parents she’d have. Uncle Max died in 1941 and Aunt Laura in 1943 – while I’m sure Grandmom would have liked their support for much longer in her life, at least by then she had a husband and children of her own. A description of her parents was passed down, but I’m not sure if the memory came from my grandmother or her older siblings – likely the siblings since she was so young when her mother died. But, her mother was remembered as a very short, fiesty woman who ruled the household – and ruled her husband, Joseph, whom she called “Sepp” for short. Although he was taller than his wife, he but obedient to everything she said. My Grandmom was called “Aunt Margie” by her nieces and nephews. She seemed to be very close to them, especially her nieces Marie and Mabel who were only 7 and 11 years younger than her (her sister Marie’s daughters). After Grandmom died, I found some correspondence in her house that she had saved over the years from her niece Helen and nephews Bob and Carl, all children of her brother Joseph. She made ceramics as a hobby. Two that have survived over the years are a Christmas tree (with lights) and a candy dish shaped like a sleigh that says “The Pointkouski Family”. I remember from my childhood that she made my brother a hockey player figurine (or was it a lamp?) with a Flyers jersey, and a Tin Man lamp for my father when he played the Tin Man in a show. She was a knitter and made afghans. I still have one she made for our family. She was blind in one eye for the last 20+ years of her life. I think it was due to glaucoma. Max (born 1905) is the young man leaning on the rear of the truck. 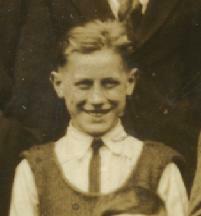 His younger brother Julius (born 1908) stands at the front. I’m far from a Photo Detective and did not do much research into the time period of the photo, but based on the style of the truck and the apparent youth of the brothers I would date it to 1925-1928. The scan of the photo is not of the highest quality, but there are a number of great details in the photo if you zoom in. For example, the building directly behind the front of the truck appears to be a telegraph or telephone station (note the sign with the bell in the upper left). The store is a stationery story that sells notions – this is just visible through the windshield of the truck. The confectionary store (behind rear of truck) serves Reid’s ice cream (“It’s the Best”). Just behind Max’s head you can see signs for the Ringling Brothers Circus that was coming to town on May 16. The most interesting thing I found while zooming in on the photo is the profile of a man or woman in the window on the second story to the left of the ice cream sign. 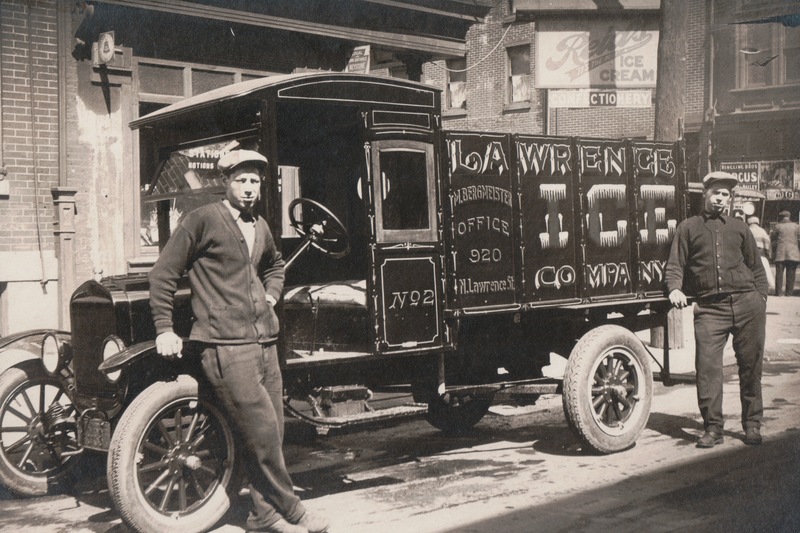 Max started out in the ice business, but by the 1930’s he owned what was called a “soda fountain” in those days. My dad was the envy of the neighborhood because his uncle had a candy and ice cream store! He owned the business for many years. His brother Julius worked as a driver, but at some point he became a Philadelphia fireman and had a long career with Engine Co. 51 in the same neighborhood. 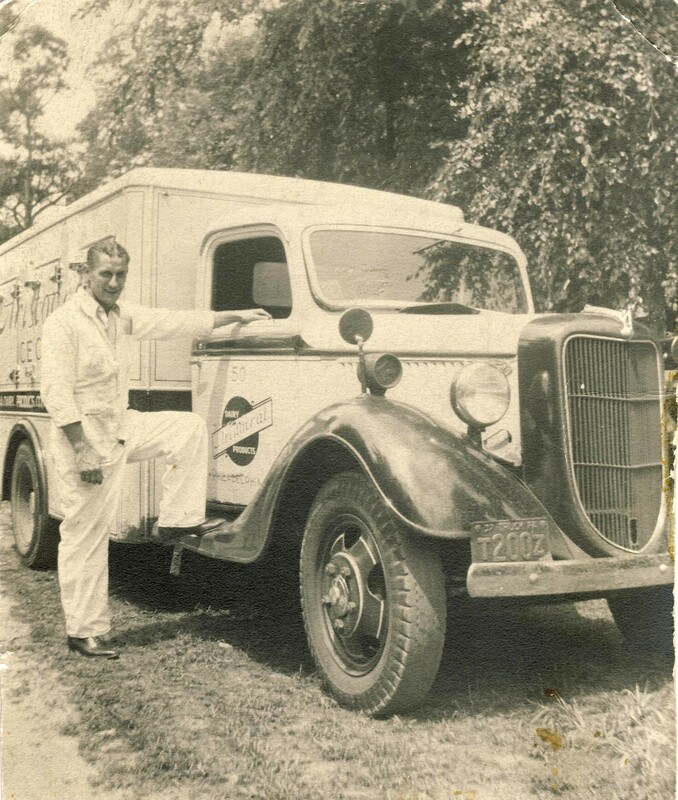 Another driver used to deliver ice cream to Max’s store – a young man named James Pointkouski (see a 1937 photo of James and his ice cream delivery truck here). One day James noticed the girl behind the counter. Excited, he asked Max, “Who is that?” Max responded with an indifferent shrug, “Oh, that’s just my sister.” I guess I should be grateful to Max for being a businessman, because at that moment his friend and deliveryman James met his future wife, Margaret. It would take many more years before they would become known as my grandparents. “One hour – got it!” Wow, even time travel has restrictions. I turned on the machine and within a minute I was back in 1940 and walking the streets of Philadelphia. I didn’t have much time, but fortunately I had a good idea of where to go. I was a bit nauseated at first, but my focus became clearer and I could see where I was – Thompson Street. I needed to turn down Venango Street to get to Mercer Street, my first destination. The weather in Philadelphia on April 4, 1940 was warmer than the previous day – nearly 63 degrees and dry. People were going about their daily business and the streets were not deserted – people were out walking. Cars were few. I could hear faint sounds of Big Band music coming from a house fortunate enough to own a radio. The music was great, but I also love the fashions of the 1940’s – there’s a guy in a suit and a fedora walking down the street. I look great dressed up in a skirt, blouse, and pumps – and only in 1940 could I get away with wearing a hat! I quickly found Mercer Street. I knew the real census enumerator had been there the day before; I was just an interloper. I hoped my plan would work to avoid any suspicion as to who I really was. I tried to look official and get to know the neighbors on my way to almost the center of the block – 3553 Mercer Street. As I passed by #3505, a young girl came out carrying an even younger girl. Were they sisters? I heard the older say, “Come on, Peanut, I’ll get you home.” Oh my, I thought, that’s Rita Mroz and – no way! Rita lived with her 3 sisters, 2 brothers, and Polish-born parents, but the little “Peanut” she was carrying was definitely not her sister. In fact, she was heading right towards my destination! I watched while Rita safely delivered the young girl back home. There it is! 3553 Mercer Street. A 7-year-old girl sat on the front step, looking quite unhappy that her younger sister arrived back home. “I’m not allowed to talk to strangers,” replied the girl. And with that, she ran inside. I knocked, and a handsome man came to the door. I was momentarily stunned, but I quickly recovered. “I work for the Government,” I stammered. Well, at least that’s not a lie. I explained that although the census enumerator had been there the day before, I was a supervisor performing a spot-check to ensure that the responses were recorded properly. Her husband yelled an explanation back and I saw her take a peek from the kitchen. She looked so young! And pretty! “Henry Pater.” Boy, I thought, Mom was right about those grey eyes! He’s so much more handsome than any photo I ever saw. I learned about 7-year-old Joan and 4-year-old Anita, the “peanut” I saw earlier. Upon hearing her name, she appeared and hid behind her father’s leg. “This is Anita,” he said, “but I like to call her Chick!” Anita giggled. Finally, Henry told me his father-in-law, Joseph Zawodny, also lived there. Henry told me that Joseph was married. I didn’t need to ask where his wife was – I knew she was in a mental hospital. I would visit her on another trip back to the past. Where are you, I thought. As if he heard me, I saw an older man peer out of the kitchen and ask Henry something in Polish. If only I could answer back or get the chance to talk to him! There is so much I want to know, and I’d like to know him so much. I knew my time was running out. Reluctantly, I thanked the Pater family and took my leave, waving bye to little Anita on my way out. I’m off to see your future husband now. How do I get from the Port Richmond neighborhood to Northern Liberties fast? Sometimes future technology has its advantages, and I found my way more quickly than I thought possible. Suddenly I was walking along Germantown Avenue. I couldn’t go up and down every street with my limited time – when I saw the meat packing plant on the corner of 3rd and Thompson, I knew I was in the right place. The census-taker wouldn’t walk these streets for two more days, but fortunately my destination was right on the corner so I didn’t have to fake my way through several houses. Right on the corner at 1300 Germantown Avenue, I spotted a young boy sitting on the front step. I was stunned and forgot where I was. “Nick?” I asked. The curly-haired boy looked up at me and smiled. “No, I’m Jimmy and I’m 5. I’ll be 6 this summer,” he said proudly, blue eyes sparkling. Suddenly a woman came to the door and she didn’t look happy that I was talking to her son. After I explained about the census, she invited me in and once again I tried to look around the home’s interior. This house rented for $5 more than my last stop, and I wanted to see if it was worth the extra money. I also couldn’t stop looking at the woman, Margaret Pointkouski. As I took down the information she provided, I questioned the spelling. “That’s with a U, not a W?” I asked. Margaret looked so – what was the word? Young! She was 28 years old – well, that’s what she told me, but I knew her 28th birthday would actually be the following week! Just then the door opened and a young man entered. “Well, hello!” he said as he tipped his hat and leaned over to kiss Margaret. Just as with Henry, the 29-year-old James looked so much more handsome than any photos I had ever seen. I couldn’t help but smile back. When he heard who I was, or at least who I was pretending to be, he commented that he didn’t know there were “lady census takers”. “Oh, I will,” I assured him. Just maybe not today. The Pointkouski household was small with only the couple and their young son, Jimmy. I was bursting to tell Margaret that she would get pregnant late the following year and have a daughter, but I knew it wasn’t my place to speak of such things. I asked my questions – not the ones I wanted to ask; I could not ask those questions. Like where are your siblings living right now? I hadn’t visited them yet. Oh, there were so many questions I could not ask. But I asked the “official” questions and I was very happy to hear the answers. All I kept thinking was: this is so cool! I actually wrote this the night before the carnival topic was announced. I’ve told a few stories on this blog, but I never presented factual information in such a fictional way. Technically, I’d call this creative non-fiction. To me, talking about finding a genealogical record (on my “machine”, aka my laptop) can sound a little boring, at least to non-genealogists. But how could a science fiction lover like myself resist seeing that search for the record as time travel! The idea took hold and would not let go. Face it – bringing up those images, walking through the neighborhoods, reading all about the families – it is the closest thing we can get to time travel! The Census facts came from the actual 1940 Census (source citations upon request, I used Ancestry to access). I saw the path the enumerator took and learned about the neighborhood layout from a combination of current maps and a 1942 map of Philadelphia courtesy of the Greater Philadelphia GeoHistory Network. What was the weather like on those April days in 1940? Well, I learned about temperature and precipitation totals from The Franklin Institute! I knew about fashion from the movies and my parents. I have an idea what the characters looked like from photographs. As for the personalities of the individuals – everything I know, I learned from my parents. Of my grandparents, I knew my maternal grandmother the best. 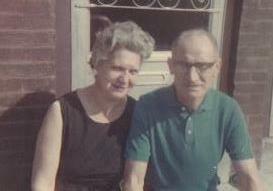 Second would be my paternal grandmother, with my paternal grandfather third. Least of all, I knew, or rather didn’t really know, my maternal grandfather – he died when I was five years old and I only met him a few times. I’m glad I could get to know them all in the 1940 Census! Imagine yourself as an immigrant to America in the early 20th century. You are happy with your decision to leave your homeland for a new life in America. Perhaps after a few years you saved enough money to send for your wife and children to join you. You have found a job, and you have found a house to live in. Perhaps you don’t yet understand the English language perfectly yet, but you are slowly learning. You may not get much practice with English though, because your neighbors and co-workers speak your native language. One day someone knocks on your door – they are from the government, and they ask all sorts of official questions. “Who lives here?” “What are the names of your family members?” The questions were dutifully answered. Fast forward eighty or one hundred years. Descendents of those immigrants pour over online or microfilmed images in search of answers about their ancestors. Families are found! But…is the information correct? Most of the time, it is correct. But not always, at least not in my family. Ignoring the numerous name spelling errors, the most unusual census mistakes in my family involve relatives that were counted twice! The first example of this was in the 1910 census for the family of Joseph and Antonina Pater (which is listed as “Potter”, or how Pater sounds in Polish). In 1910, most of the family was living just outside of Philadelphia in the Bucks County borough of Attleboro (today known as Langhorne). Because Antonina’s mother had recently arrived and she was the oldest family member, she is listed as the head of the household (F. Annie Pluta indexed as F. Amie Theta…seriously, it’s a wonder I find anyone in the census!). 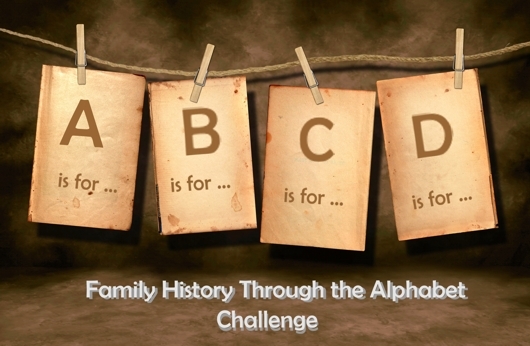 The 70-year-old F. Annie is followed by Joseph and Antonina and their six children (although there is some confusion as some are listed as grandchildren of the head of the household and others as children). The only problem? The two eldest daughters, Frances and Eva (listed as Francesca and Edna), were already married with children and living elsewhere. Frances’ husband Paul and their son Edmund may be enumerated as a separate family underneath the Pater clan (listed under equally mangled and hard-to-read names). Eva, her husband Edward Süsser, and their children Edward and Anna are all enumerated on the census in Dover, Morris County, New Jersey (as the “Züsser” family). In this case, only Eva is counted twice since I did not find another listing for Frances. I believe that the married children who were not actually living with their parents were listed simply due to a language mis-understanding when the census taker asked for the names of their children. By 1920, the Pater parents only list those children still living with them (Walter and Victoria). A more curious case of double-counting happened in the 1930 census. 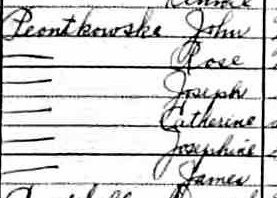 My Piontkowski ancestors, John and Rose, had been living in the United States for 25 years, so I would have assumed they had a better understanding of both the English language and what the census-taker wanted after having participated in two other federal censuses. The couple leaves out their daughter, who by this time had married and left the family, but counts their teenaged son, James, as well as their married son Joseph, his wife Catherine, and their daughter, Josephine. The entire family lives on N. Front Street in Philadelphia. I knew that Joseph Piontkowski later used the surname Perk, but I never thought to look for Joseph Perk on the census. Why should I? I had already found him living with his parents. Only he really wasn’t living with his parents in 1930! I recently got in touch with my cousin, Joseph’s daughter, who had been researching her family. When she wrote that she found the Perk family listed in the 1930 census, I did a double-take. Sure enough, they are living on Hancock Street in Philadelphia about a mile away from his parents. Listed are Joseph Perk, wife Katherine, daughter Josephine, and daughter Jean – who, based on the age of 0/12, had just been born! Anyone without knowledge of the name change would certainly think that these were two different families, but they are the same. I wonder how inflated the census numbers are/were due to difficulties with immigrants understanding the questions? Oh well, Eva Süsser, Joseph, Katherine, and Josephine Perk may all have been counted twice in one census or another – but at least that makes up for my grandmother Margaret Bergmeister not having been counted at all in both the 1920 and 1930 census! 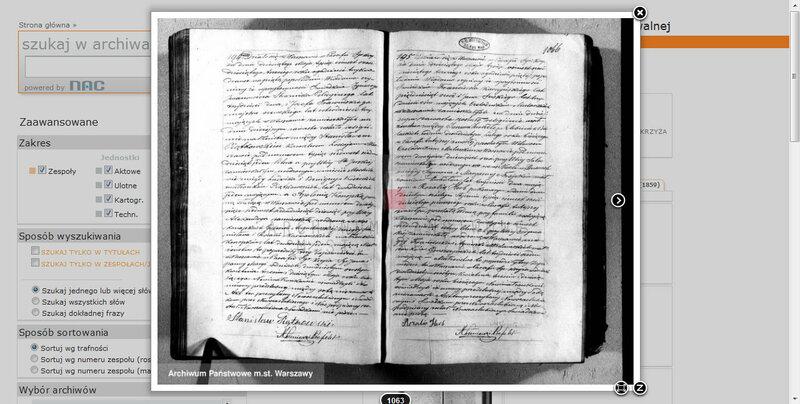 Yesterday I mentioned my “easy” online find of a 19th century Polish marriage record via a site called Geneteka. In this post, I’ll provide more information on the site, what’s available, and how to navigate. 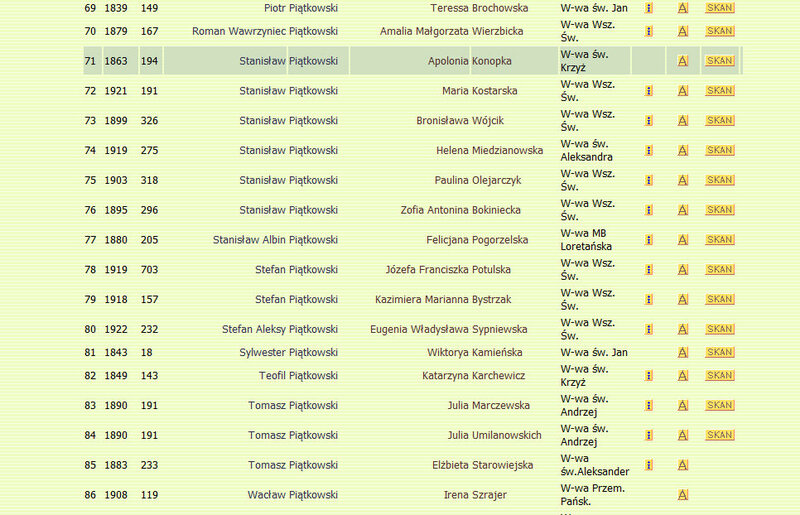 But first, a word on various Polish sites that offer genealogical records or indexes. It’s becoming more and more common to find genealogical records online in the United States thanks to both “free” sites, such as FamilySearch, and paid subscription sites like Ancestry and Footnote. Although FamilySearch and Ancestry both have some international records, not many are from Poland – which is where most of my ancestors are from. But, there are Polish records available online – the only problem is knowing where to look. There are several web sites and genealogical societies in Poland that are in the process of indexing millions of vital records, but most of the sites are in Polish (a notable exception to the language issue is the Poznan Project, which is in English). There doesn’t seem to be one central online repository for these records, so finding them required some sleuthing and a heavy use of online translators to understand the Polish instructions. Your first stop to check on availability of Polish records or indexes online should be the Indeks Indesków <EDITOR’S NOTE 10/2015 – the site this article referred to no longer exists; another site uses the same name but does not offer the same content>, which means the Index of Indexes. It is in Polish, but it’s not too hard to figure out. The site lists updated indexes in chronological order starting with the most recent. But to see the entire list of what is available for each province, simply click on the name of the province (woj.) at the top of the page. The column on the far left shows the Parafia/USC or the name of the town parish/civil registration office. Next, the list will show what years are available online for chrzty/urodziny (christenings/births), małżeństwa (marriages), and zgony (deaths). The final column, strona www, provides the link to the site or sites that have these indexes or records. There are a dozen different sites! 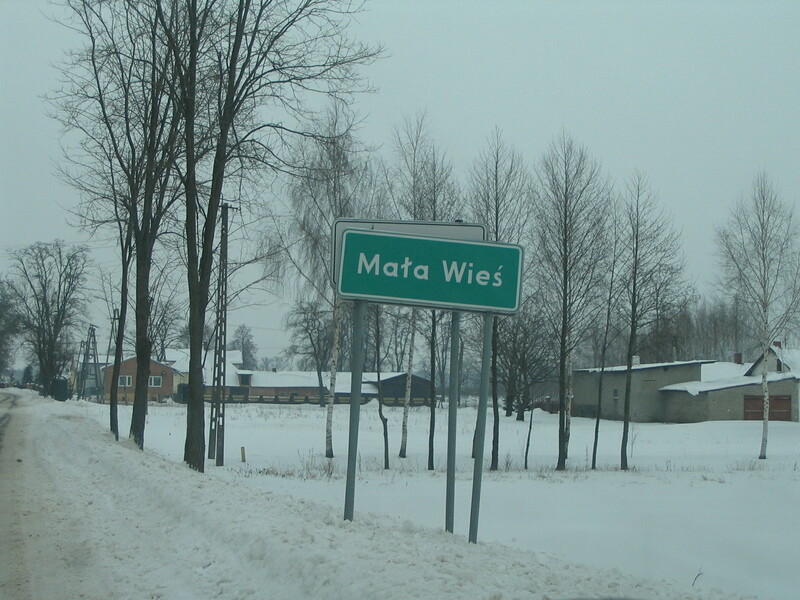 Many of my Polish ancestors come from the mazowieckie provice and I was fortunate to discover that several of my main towns (Żyrardów, Mszczonów, and Warszawa) all have either indexes or the actual records available via Geneteka. A full and very detailed explanation of the Geneteka site has already been written by Al of Al’s Polish-American Genealogy Research in June, 2009. Please read his series of posts starting with Indexing Project – Geneteka Part One. When you’re finished reading Al’s posts, come back here and I’ll explain my search. Using this Geneteka search page, I entered my surname Piątkowski without the diacritical (entered as Piatkowski) in the box that says Nazwisko and clicked on the Wyszukaj button. This page opens up after clicking on “skan” next to the Piatkowski-Konopka information. I knew from the indexed information that I needed record number 194, so I clicked on the first image on this page. It opens up a larger view of the records, and you can clearly read the number. Then I used the navigation buttons on the side to find #194. Navigate through the records until you find the correct number (located in upper left of each record). Once you find the correct image, you can save it to your computer. It’s FREE! Then all you need is either your trusty copy of In Their Words: A Genealogist’s Translation Guide to Polish, German, Latin and Russian Documents. Volume I: Polish by Jonathan D. Shea and William F. Hoffman or your favorite Polish translator to help you uncover the details found in your record! What if you find a name, but there is no “skan” at the end of the line? That means they have not (yet?) scanned the record. However, you now have both the year and the akt (act) number, which means you can contact the archives in that region to get a copy. There will be a fee to obtain it, but it will be less than if you required them to research the name in the indexes themselves to find the correct year and act number. This isn’t a full explanation of the Geneteka site – I am still figuring it all out myself. Al already gave a very good primer on how to use the site, and I highly recommend his series that I linked to above. 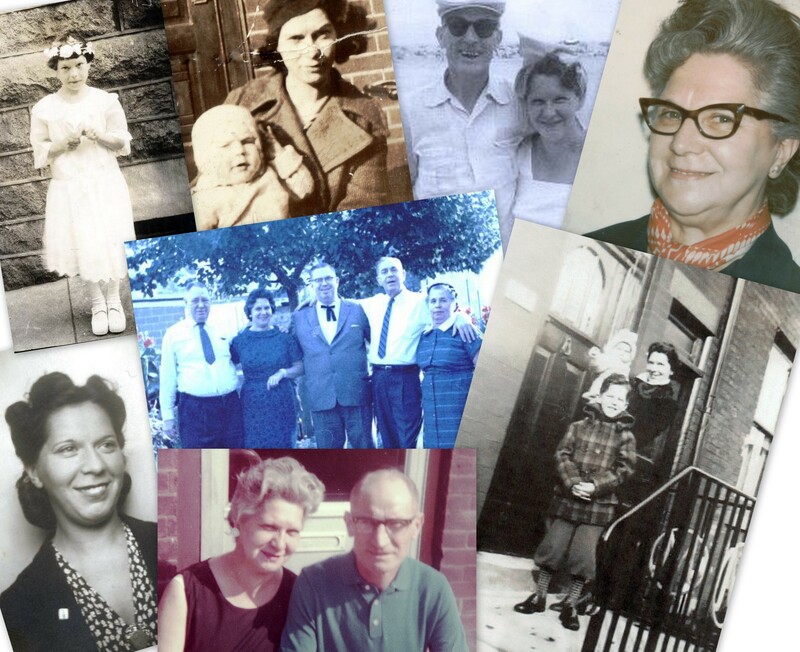 My main goal in writing this post was to let others who are researching Polish ancestry know that the records are out there (to borrow a phrase from the television show X-Files). Unfortunately, the records are being indexed by over a dozen different groups, and there is no one central site for this information. Check the Index of Indexes to see if your ancestors’ parishes have been indexed yet. If they haven’t – keep checking the site! It is updated frequently. All of the indexing sites appear to be quite active. This marriage record only appeared in the last month. If anyone else has good luck in finding a record on one of the many Polish sites, I’d love to hear more so leave a comment. There’s one in every family…the one who vanished. Or at least seems to have vanished. That mysterious figure that family members whisper about. That person known in name only with no photographs as a remembrance. That relative about whom know one really knows what happened. My grandfather’s sister, the aunt my father never met, ran away and disappeared. At least that’s how the story goes. I was successful in documenting the beginning of her life, but then she disappears from public records without a trace. She is the family legend – the one who disappeared. Janina Piątkowska was born on December 29, 1905 in Warsaw, Poland to Jan Piątkowski and Rozalia nee Kizoweter. 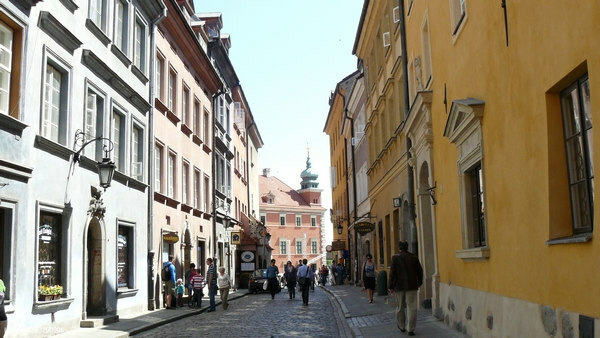 The family lived in the Wola section of the city, and she was baptized at St. Stanisława Church. 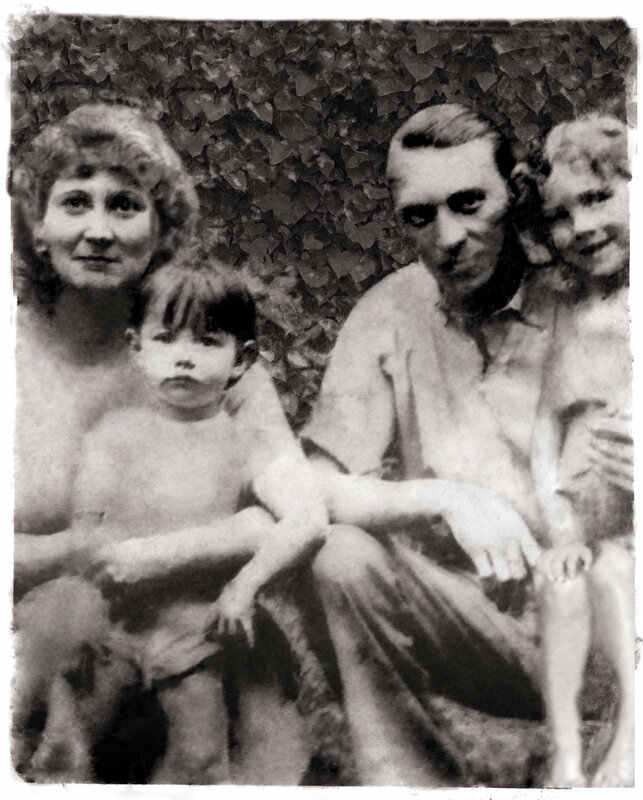 Janina had an older brother, Józef, who was born two years earlier. Just a few months after Janina was born, her father left for the United States. He settled in Philadelphia, PA and found work in the same occupation he had in Poland – leatherworking. He also began using his Americanized name, John Piontkowski. It would be over six months before the rest of the family could join him in America. In late October, 1906, Rozalia boarded the SS Armenia in Hamburg, Germany with 3-year-old Józef and almost 1-year-old Janina. They arrived at Ellis Island on November 10, 1906. By 1910, the Piontkowski family was living on Huntingdon Street in Philadelphia (listed as the Kilkuskie family in the census). On July 6, 1910, my grandfather James was born. He would later be called the “surprise” baby; mother Rose was 44 and father John was 39. In 1920, the family lived on Waterloo Street in Philadelphia. John worked in a leather factory, 18-year-old Joseph worked in a file factory, and teenager “Jennie” worked as a cigarette-maker in a cigarette factory. Nine-year-old James attended school, and mother Rose did not work outside of the home. Later that year, John formally declared his intent to become a U.S. citizen. In 1922, John filed his petition for naturalization, and all three children – Joseph, Jennie, and James – were still listed as living with him. His naturalization was finalized on May 11, 1923. In the 1930 census, the family lives in yet another Philadelphia residence – this one on N. Front Street. Joseph is now married, and his wife Catherine and their 2-year-old daughter Josephine are living with John and Rose. Twenty-year-old James is living with them, but his sister Jennie is no longer with them. Where did she go? The story of “Jennie” – also called by her birth name “Janina” and “Jean” or “Jeannie” – was passed on from my grandfather to his children. I have no other documented facts about her beyond the 1922 petition of her father, just the story as told by her younger brother. He said that she was working as a waitress and met a “rich” doctor. They fell in love, he offered to “take her away” from the drudgery of the family’s working-class life, and they “ran off” to Florida. End of story. My grandfather never heard from his sister again. I searched the Philadelphia marriage indexes for a marriage record, but did not find one. This isn’t necessarily unusual – although my grandparents and one set of great-grandparents all lived in Philadelphia at the time of their marriage, they actually got married in three different towns outside of the city’s limits. But without knowing Jennie’s married name, I haven’t been able to find out any more information about her. The only certainty is that she did either run away or move away and never had contact with her family again. Did she know that her mother died in 1937? Or that her father tragically took his own life in 1942? Her older brother Joseph, who used the surname Perk, died in 1953, leaving young children from two different marriages. At the age of 43, my grandfather had lost all of his immediate family members – except possibly for his big sister. He even named his daughter Jean in honor of his sister, but neither Jean nor his son James would ever meet their mysterious aunt. If Jennie really did fall in love and run away to get married, it may be most romantic story in my family’s history – even more so if she married a wealthy doctor who could give her luxuries she never knew in childhood. Did she live happily ever after? Or did she encounter tragedy? I certainly hope that her life was long and happy. Did she have children? If she did, did she tell them her birth name and where she grew up? Unfortunately, there are some questions that are not easily answered when researching family history, especially when it’s a family mystery. There’s one unsolved mystery in every family, and mine is my grandaunt Jennie. I know a little about the beginning of her life; I hope to one day learn the truth about the rest of it. Whether it’s a romantic dream or a tragic tale, you probably have one, too – there’s one in every family! Photo courtesy of the State Library of New South Wales. No, this isn’t Jennie, but I thought it best represented her story! 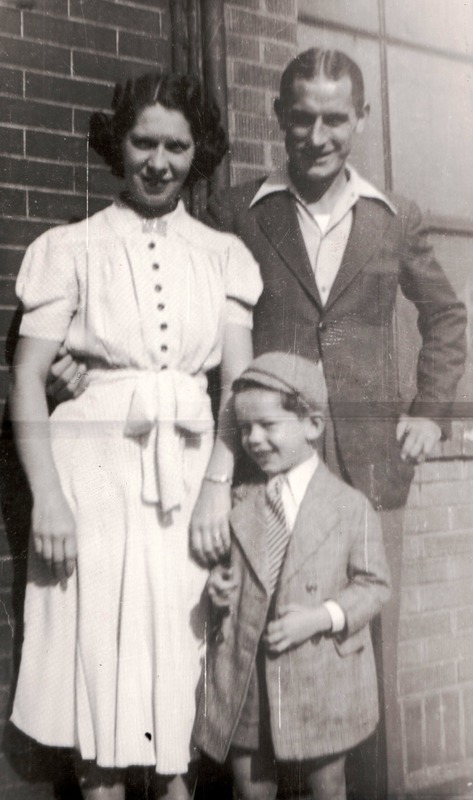 My grandmother, Margaret Bergmeister Pointkouski, with her children James and Jean in front of their Philadelphia home. Note the spiffy pants on my dad! 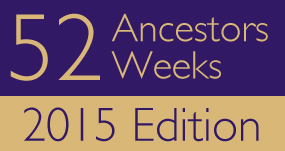 Two years ago for Mother’s Day I posted a pictorial view of my maternal ancestry. Today, in honor of Father’s Day, I present the Pointkouski men. Unfortunately, I don’t have any photos of my great-grandfather Jan Piątkowski. My grandfather, James Pointkouski, and my father, James Pointkouski, in 1942. 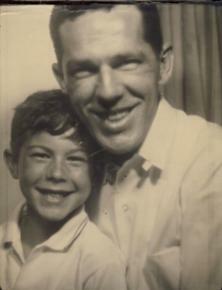 My father and brother, James D. Pointkouski, around 1965. The line goes on! My brother and the two youngest Pointkouski men in 2010. The word prompt for the 20th edition of the Smile for the Camera Carnival is Valentine! Here’s a photo of a couple who were each other’s valentines for a long time – my grandparents. When the photo was taken, they had been married for 23 years. James Pointkouski first saw Margaret Bergmeister working at a stored owned by her brother. He was friends with the brother, and immediately asked him who she was. Like a typical brother, he replied, “Her? Oh, she’s just my sister” as if that meant she was nothing special. But she was special to “Jimmy” and he immediately pursued her and eventually married her. Her brother didn’t mind! I recently had the pleasure of posting all of my old grade school class pictures on Facebook for my classmates to see. Many said, “You still have those?” The others decided it was because I was a genealogist, which is better than being called a pack rat. 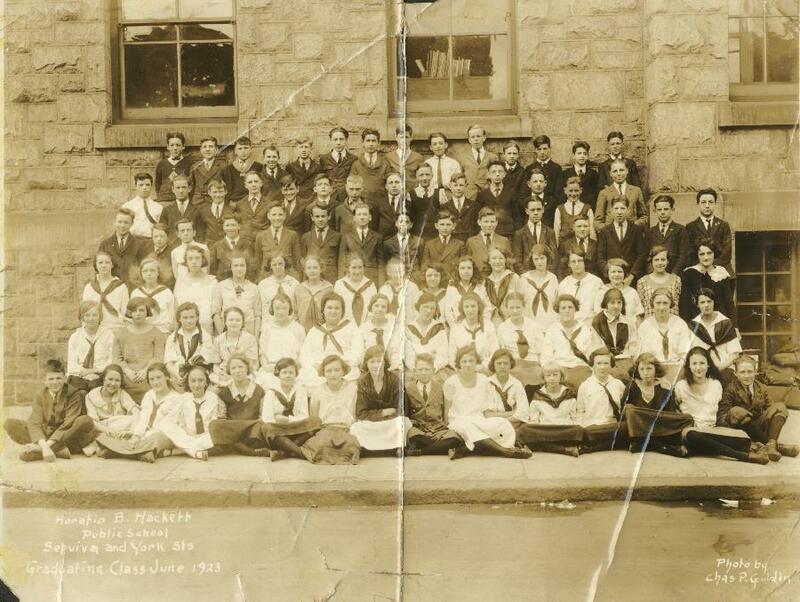 I never dreamed I’d find any school photos from my grandparents’ days, but my aunt presented me with this gem – my grandfather’s 8th grade class photo in 1923. It is the Horatio B. Hackett public school in Philadelphia, which is still educating youngsters today. In this photo he is about a month shy of 13 years old – the youngest age of any of his photographs. From what his children said, he loved going to school and did very well. He would have loved to continue through high school and college, but like many kids in those days he was not able to finish high school because he had to work to help support his parents. 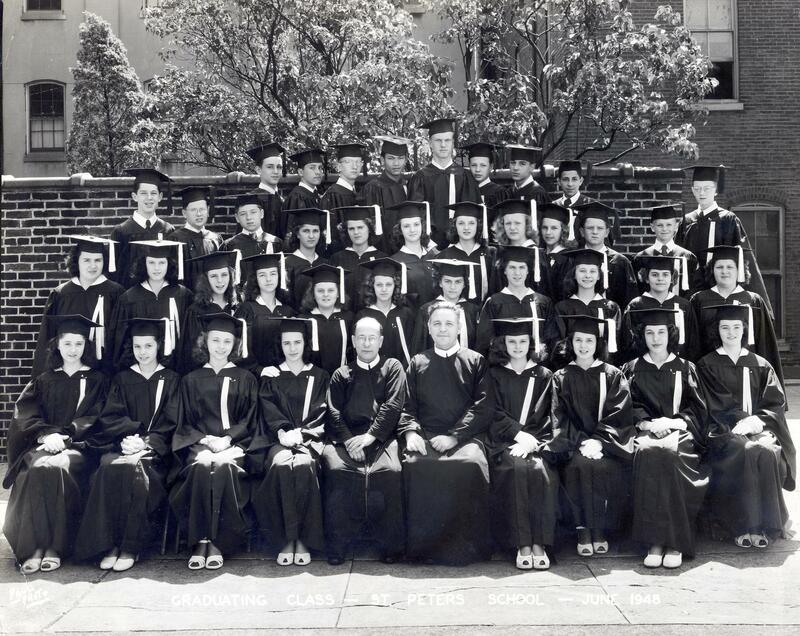 In June I posted the class photo from his son’s 8th grade graduation in 1948. If I could find a class photo for my brother’s class in 1973 it would make a nice collection of the patrilineal line at the same age. July 18, 1937 - James Pointkouski delivering dairy products to the Silver Lake Inn. According to his children, Grandpop was a really smart guy who excelled in school. His dream was to be a draftsman. That occupation would have required some specialized training and education, but there was not enough money to realize that dream. Jimmy was the youngest of three children, and his parents were rather old at the time of his birth – his father was 41 years old and his mother was nearly 44! In 1910, it was very unusual to have a child at those “advanced” ages. By the time Jimmy was ready to go to high school, his parents needed him to get a job to help the family. Although both of his parents were deceased by the time my grandfather was 32 years old, it was too late for him to embark on a major career change – especially since he had a family of his own to care for by then. So it was that Jimmy became a truck driver. It may not have been his career of choice, but he grew to enjoy it and he took great pride in what he did. I have another reason for showing off my grandfather’s photo today – today, July 6th, was his birthday! If he were still alive, he’d be 99 years old. Unfortunately, he died in February, 1980 at the age of 69. Happy Birthday, Grandpop, and thanks for working hard for the family! This is the time of year for graduations! My niece will graduate 8th grade this week, so in honor of the event I’ve posted this photograph of her grandfather graduating 8th grade in 1948. James Pointkouski is in the second row from the top, first person on the left. Also in that row at seventh from the left is Rita Bergmeister, his first cousin. Happy Graduation to all graduates from the Class of 2009! In the Roman Catholic tradition, the month of May is usually the time of “First Communion.” On Saturdays and Sundays in early May, you can still see processions of children dressed in white as they enter church to receive Jesus in the Eucharist for the first time. The age for this event varies, but it usually occurs in the second or third grade. In the past, as you will see in the “vintage” photos below, First Communion occurred in first grade. In celebration of May and First Communions everywhere, here are some photos of my father’s First Communion Day – May 11, 1941. Today boys don’t usually wear shorts and knee socks! There are several photos of the procession of children into the church, St. Peter’s, located at 5th & Girard Avenues (today the church is also the national shrine of St. John Neumann). In the first photo below, you can see my father as the fourth child from the left in the row closest to the nun. He appears to have noticed the photographer! The photo that follows shows him walking out of the photo’s range. 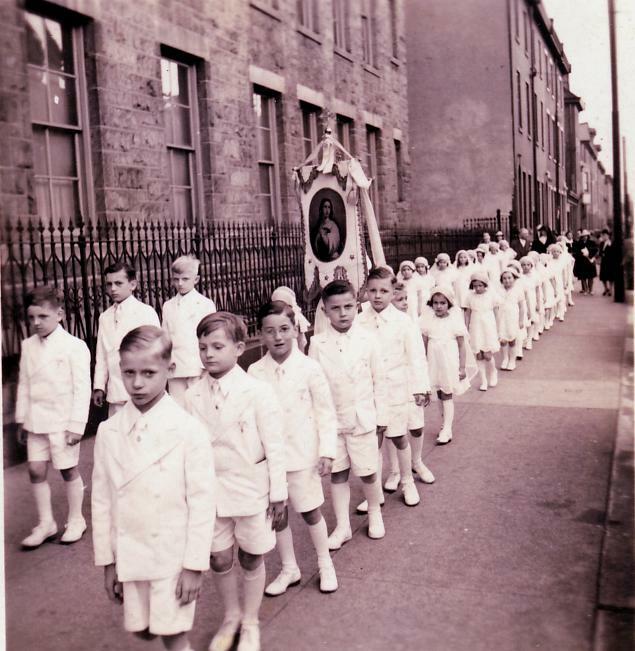 The final photo shows the girls in the procession – and since I’m sure that the rules did not change by the time I made my communion in 1975, the children are likely lined up in alphabetical order. Therefore, one of those gals is likely my dad’s first cousin, Rita Bergmeister. Brother and Sister: A Family Tradition! Little did Jimmy know then that history would repeat itself. Jimmy grew up and got married. His wife was surprised at the large age difference between brother and sister – surely they wouldn’t have children that far apart. Their first child was a stillborn baby girl. But a son was born the following year, James Drew. Despite efforts to provide brothers and sisters to only-child Drew, none came. None, that is, until shortly before Drew’s eighth birthday when a new addition arrived to the household – a baby sister, Donna. Drew was happy at first, but quickly became dismayed and suggested that perhaps our parents ought to “return” me to the hospital as if I was broken. When asked why, he replied, “She can’t talk and she can’t walk – she can’t do anything!” Fortunately I got a repreive from my parents, and eventually I learned how to talk, walk, and do everything. Having an 8-year gap between brother and sister has its ups and downs. My aunt and I had a big brother to look up to; my father and brother had a little sister to protect. But by the time my aunt and I were old enough to really “get along” with our brothers, they were out of the house on their own. Because of that, both brother and sister experienced life as an “only child” while also knowing the joys and sorrows of being a sibling. One thing is for sure – no matter how old we all get, no matter if we see eye to eye or not, or have anything in common, as my mother always says, “Blood is thicker than water” – which means we’ll always be there for each other no matter what. That’s what brothers and sisters are for!